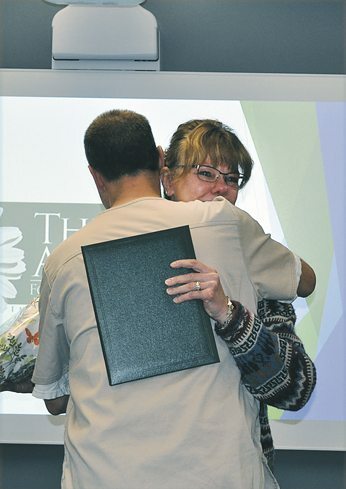 — Daily Freeman-Journal photo by Anne Blankenship Janine Mouw, RN, gets a hug from her husband, Jeremy, after being named the 2018 VDMC Daisy Award recipient. Janine Mouw has been employed at the local hospital since 1994. She works in the facility’s infusion center. A Van Diest Medical Center nurse who works in the facility’s infusion center was selected as the the 2018 Daisy Award winner in a ceremony Monday morning. Janine Mouw was selected as the recipient of the Daisy Award for 2018. She has worked as a nurse for since 1994. Mouw said she likes what she does, especially the interaction with patients. Mouw received a bouquet of daisies and a plaque with the award. Twenty-eight nurses from VDMC and the family health clinic were nominated for the honor. The nominations came from patients, families and co-workers. Others nominated were Alison Keane, RN, Ashley Burtnett, LPN, Brittany Sadler, RN, Chad Rasmussen, ARNP, Cindy Christensen, RN, Diana Patterson, RN, Deb Thielen, RN, Holly Carter-Larson, RN, Jackie Loux, RN, Josie Lambert, LPN, Julie Olson, RN, June Weiss, RN, Kara Christian, RN, Katelin Hartmann, ARNP, Katie Duerr, ARNP-CNM, Leigh Bycroft, RN, Libby Mitchell, RN, Lisa VanDeer, RN, Megan Martin, RN, Melissa Vaughn, RN, Michelle Hill, RN, Monica Rentz, RN, Robin Meyer, RN, Sarah Gilbert, RN, Shar Vandi, RN, Tina Hornung, RN, and Wally Ubben, RN. Each nominee was introduced and awarded a pin and certificate before the award recipient was named. The Daisy Award for Extraordinary Nurses was created by the family of J. Patrick Barnes as a way to honor his memory and to say thank you to nurses everywhere. The event also kicked off National Hospital Week, which is observed May 6-12.